As an assignment for a class "Innovation in Digital Marketing" taught by NYC-Google employee and professor Brian Moroz, I produced this case study of how the 2013 Fashion Week collaboration between Top Shop and Google could have been ever more successful. For the London Fashion Week 2013 Top Shop and Google teamed up for what is claimed to be the first interactive live streamed fashion show. By using a selection of Google properties and Top Shop’s owned channels the show became a pioneer for future fashion shows using a number of different digital and real-life activities pre, during and post event. They utilized a combination of in-store Google + booth, Google +, 3D Google Maps, Google + hangouts, YouTube, Model Cam & Shoot The Show and “Be the Buyer” app. Three days prior to the event a “Be the Model” digital photo booth was housed in the London Flagship store on Oxford Street. Shoppers could try on outfits and pose for pictures in the booth and share the animated GIF’s with their friends. In addition they installed a giant screen in the store that live streamed the events before and during the catwalk. The show was also live streamed on Google + (over 2million users watched the show online) and users could follow the models experience before the show and throughout the day. The entire live experience garnered over 4 million views across a multitude of platforms. Content around competitions and model diaries were shared to build anticipation. Using Google Maps technology, viewers were able to see inside the venue and around the gallery before the show. 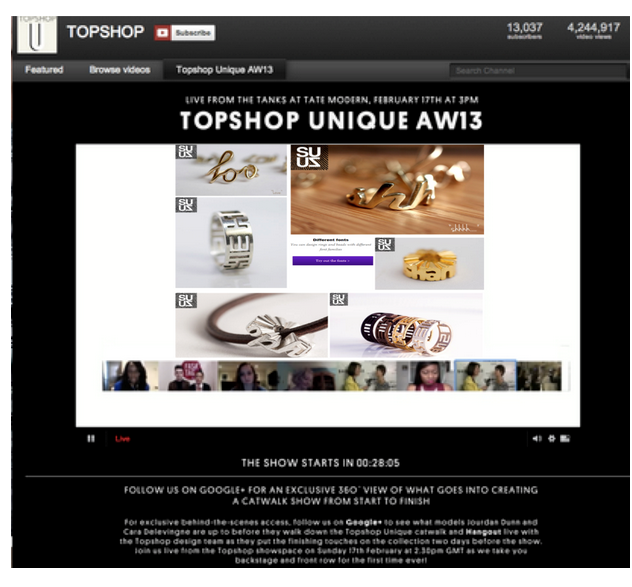 Top Shop used Google Hangout’s to host a live Q&A session with their design team and creative director before the show and viewers were able to watch live behind the scenes final preparation. During the show, they could also experience it from the models POV as live HD cameras were built into the models clothes. The day after the show, fans could create and share their own fashion collections on Google + using items from the catwalk. Experts and bloggers provided useful tips and awarded the user with the best collection with a shopping spree. This process contributed valuable data to Top Shop so that they could decide what to bring to retail. Following the innovative campaign, Top Shop generated a lot of PR and positive reviews across the industry. By adding the online element they gave fans a chance to participate in an experience that is normally closed off to exclusive guests at the event. The digital involvement also gave Google the opportunity to showcase the benefits of using their technology and increase awareness of their various platforms like Google +, 3D maps and Hangouts. The Fashion Show -partnership was successfully and seamlessly executed. By using multiple social media platforms actively they created the opportunity for mass-scale participation by bringing shoppers closer to their interests. By cultivating an engaged audience, as opposed to the traditional passive one, fans absorbed information to a much deeper level and gave Top Shop the power to collect real time data from their key audience. In general, the fashion industry has been a pioneer in welcoming technological advancements in its designs and shows. Burberry, Diesel, Forever 21 and Ralph Lauren are among other retail brands that have stood out in terms of creating not only a fashion show, but also implemented technology to create unique and memorable experiences. Top Shop’s effort to connect, include and engage fans across the world throughout the week was a glimpse of what is likely to become the industry standard in near future. Based on their answers they would be matched up with other users that style preferences align and be encouraged to “follow” them and to see which items they “favorited” during the show and purchased in the store. Users would receive recommendations to follow dedicated Top Shop-stylists, popular bloggers and friends from their linked social media accounts. In addition to creating value for their users, responses would provide Top Shop with relevant and useful information for further personalizing their future marketing efforts. The network of profiles would be an open society for fashionistas. The goal would be to foster a creative safe-space where friends and people with shared interests and styles can connect, collaborate and enjoy a variety of innovative features. API’s Facebook, Google + and Instagram profiles would be featured within the unique Top Girl profiles so that users could seamlessly upload pictures of outfits from the catwalk or of themselves onto their other social networks. By using the hash tag (#topgirl+) they would be displayed directly within their own Top Girl + profile. This would eliminate the need for shoppers to upload pictures multiple times, in addition to creating a unified way to integrate real-time feedback and likes from friends on social networks not (yet) associated with Top Girl + profiles. The photos and hash tag’s would spread authentic user-generated advertisement for the Top Girl + profiles across all the major social media networks like Facebook, Instagram, Twitter and Google +. The Top Girl + profiles would be linked with users’ other social networks and encourage them to invite friends elsewhere to join the Top Girl + society. Friends would have the ability to suggest what items they think would suit one-another, virtually dress each other up and press “go for it” and “not my style” buttons on their friends’ favorite items within the profile. Not only would this be the easiest way for friends to provide feedback, it would also grant Top Shop significant information regarding their clothes success and different consumers profiles’ preferences. Users would also be able to create wish lists and friends could purchase wish list items as gifts for other friends that would automatically ship directly to the users address using Google Wallet API’s. On users birthday’s Top Shop would encourage users to purchase their friends wish list items by offering free same-day shipping to the birthday-girl/boys home address. Every week Top shop would nominate the most stylish Top Girl. The person who showed most interest and uniqueness in forming their profile would win a “shout-out” and gift card. This would add a competitive element to the profiles and reinforce engagement with the brand. As Top Shop converges towards a more online retail business they could eliminate one of the determining factors that make some shoppers weary of online shopping (the fear of the clothes not fitting). There are now many technology companies that deliver in-store fitting room experiences online, and provide shoppers with photo-accurate, mirror-like, visualization of fit. One of the key features in the profile would be the opportunity to upload personal body measurements, shoe size, personal preferences and various self-portraits to be applied in a virtual fitting room. Within the Top Girl + profile, users would be able to add the clothes they favorite through the “be the buyer” app to their personalized virtual closets and try on the clothes via the virtual fitting room using their webcam and augmented reality technology. These virtual fitting rooms would give shoppers the simplicity and comfort of trying on anything they like, at any time, without the long lines and fitting room item limits in-store. Top Shop could use the technology of Fits.me, Styku, Swivel and Metail to help create this. The images would be saved to the Top Girl + profiles and be sharable throughout the users connected social media accounts. Google Helpouts would be integrated as an option in the Top Girl + profile allowing users to hire personal shoppers, ask for real-time video-feedback from dedicated stylists and purchase makeover-sessions. Shoppers would have the unique option to hire professionals for a more personalized experience in addition to getting free styling tips from their Top Girl + society. Many consumers often wonder how they can integrate new clothes with old ones. Users would be able to upload photos of outfits they already own and see how the new collections would compliment their existing wardrobe by digitally mixing and matching them within the virtual fitting rooms. The virtual fitting rooms would be built into the Google Hangout app so that groups of friends could decide on outfits together before going out for parties or figuring out what to wear to a specific event. On the Top Shop mobile app, as well as within the Top Girl + profile and Google Hangout app, a Google Instant Buy button would be available so that users could easily purchase items through only a couple of clicks. Google Goggles technology would be part of the Top Girl + profile. Within the app or profile, consumers could upload images of outfits they see elsewhere and receive suggestions of how to imitate the look using only Top Shop clothes. In short, if shoppers found an expensive outfit at Chanel they could use Google Goggles to find and create a similar look using affordable Top Shop clothes. Top Shop would sponsor a few famous bloggers in all the major fashion capitals with pre-delivery of their favorite outfits from the new collection to write about to their key audience. Fashion and style varies from country to country, and this would be an authentic way for the international brand to advertise their clothes through locally favored fashionistas. It would generate free publicity and attention towards the bloggers and brand, thus creating a mutually beneficial partnership. The Top Girl + profile would also have a page dedicated to selling, giving-away and buying used clothes to other users directly through a flea-market feature in the TG+ profile. The Swedish furniture brand, IKEA, recently launched a similar feature for reselling old furniture that has reaped great success in terms of brand value. This initiative would strengthen Top Shop’s image as an environmental brand and encourage users to engage more with each other. UM’s proprietary research shows that custom content is 92% more effective than traditional TV advertising at increasing awareness and 168% more powerful at driving purchase preference. This innovative feature would also be a strategic initiative for the brand to address the raising concern of women’s body image issues cultivated by brands that use models with unrealistic body measurements in their advertisements. By marketing outfits “tailored to you” they could send out specific news updates with clothes that compliment your body shape and size by using images that you have submitted and sending personalized emails featuring yourself in the clothes. Top Shop would use the “If This Then That (ITTT)” application for various purposes. If opting in, users could “like” any outfit-photo posted by the Top Shop brand on Facebook, Instagram or Google + and automatically receive an email offer with the outfit from the new collection digitally fitted on themselves. This innovative feature would drive users to follow the brand on various different social networks, encourage engagement with the brand. Google Wallet Instant Buy APIs would be featured alongside the fashion show in the Google hangout, website streaming and Youtube channel during the fashion show, as well as in all subsequent emails. This way people could buy clothes directly from within the email, eliminating the barrier it is to leave the site. Top Shop would become a Google Trusted Store and offer shoppers the opportunity to purchase any outfit by simply clicking on the Instant Buy API on any photo the brand would share on Google + or people would share on TG+. This would strengthen the return of investment because it would eliminate the need to pull shoppers into visiting the Top Shop website later. The one-click feature would function as effective to increase sales as well as be convenient for the user considering that name, shipping and billing information would be auto-filled out. Top Shop would offer free returns as they do today, but due to the virtual fitting rooms the rate of returns would likely decrease (sparing them the additional shipping costs). Purchasing the right size would be automatic due to the linked Google + and Top Girl + profiles which contain the buyers’ measurements. Instead of just documenting the models and designers preparation before the show, one could have made the stories interactive and user-driven. In the days running up to the show, all the clothes lying around the set, as well as all the clothes worn by the models, stylists and casts would be clickable for the viewer to automatically add to their TG+ profile. In addition, viewers could click on the specific models they wished to follow further into the video to see what goes on with them. After the show, they could choose to “Be the Director” and decide which models should wear what clothes, select their own lights and music in an interactive You-Tube video. The videos you make would be sharable across a multitude of social networks. Lightbox ads featuring the new collection would be featured across YouTube, Google + and other Google platforms. The fashion industry has embraced 3D technology and projection mapping as both the backdrop for major runway shows and in the showrooms. Top Shop’s strategy was to include their fans in the fashion show event that is typically closed off for exclusive eyes-only. At the time of the event, Top Shop live-streamed the show in their store and gave their audience the opportunity to gather and experience the show together live. However, to make this even more extraordinary Top Shop could have presented a real-time 4D projected holographic fashion show outside their store on Oxford Street open to everyone interested (similar to what Ralph Lauren did during New York and London Fashion week in 2010). This way the fashion show would be real in one location and appear real in another. This would welcome more people to enjoy the live experience and energy of the event itself. Top Shop would decorate Oxford Street to make it feel like a high-class event with red carpets. Shoppers would be photographed in front of Top Shop boards and see them projected on billboards outside the store. Screens mounted inside the store would have API’s from various different social networks using the hasthtag #topshopFS. It would show how fans across the world are watching the Top Shop show online, at the event or outside the store. Following the fashion show these screens would use the same technology to display photos TG+ users create in the virtual fitting rooms- effectively functioning as real time, user-generated in-store advertisement. As models begin to walk down the runway (or virtually down oxford street in this case), the audience would stand by with smartphones and take pictures of models and favorite their outfits in the same way they could do inside the Google Hangout within the Top Shop app or Tog Girl+ profile. The video projection and holographic experience would bring a unique level of interaction for both the consumer and fashion designer, while combining something entirely digital and innovative with the benefits and excitement of a real life event. Top Shop would be able to display the look of the season and also become a technology flagship brand by creating a storytelling element and captivating the audience with both a compelling visual display and engagement effort. At the venue of the Fashion Show they would install a large screen with dynamically compiled video counting down to the show. The video would pull in location based APIs (photos posted at an exact location) from Instagram and Twitter and show real time photos of all the celebrities and people at the show publishing photos of themselves and the models from backstage. This would give everyone at the venue, in addition to the people following online, an opportunity to see who was attending the event, what they were dressed like and how they respond to the clothes after the show. It is no secret that the people attending these events are often more popular than the models themselves and by giving online followers an easy way to follow the crowd online they would strengthen the feeling of actually being present at the event. In-store customers would have a variety of innovative choices to make their shopping experience as enjoyable and easy as possible. After watching the fashion show, customers would receive email notifications upon their “favorited” outfits arrival to their nearest Top Shop store. Using the Top Shop mobile-app they could track real-time information regarding their favorite items availability and location in-store. A combination of radio-frequency identification (RFID) clothing tags , geo-location and Google Maps would allow users to pinpoint the exact location of a particular clothing item in the usually chaotic stores, retrieve information on how many sizes and colors are available and reserve dressing rooms through the Top Shop application while browsing the store. It would eliminate the time-consuming experience of standing in line, requesting sizes and waiting for sales personnel. If shoppers would like to add items to their Top Girl + wish lists that they discover while in-store, they could use the Google Goggles technology to take a picture or scan the barcode on the tag of the item using their smartphones. For those unfamiliar with the online opportunities, a digital check-in monitor would be installed near the store’s entrance so shoppers would scan their phones and be taken directly to the app where they would be informed of discount-sales, locations and availability of items they like in the store. If not available in-store they could order them directly home through the app. The app would also let shoppers track the entire shipment-process using APIs from Google Maps to be able to follow the items specific location as it travels to the buyer. The GPS mark displayed in the augmented map experience would be shown as mini versions of the outfits catwalking down the runway (streets) instead. Supplying users with information like this is proved to relieve the frustration as a result of delay, waiting and uncertainty and make shoppers more loyal. Using Google Wallet in the Top Shop application they could self-checkout by scanning the tags or inserting a barcode number. Receipts would be emailed directly. To avoid theft, alarms would be disarmed only when payment had been successfully processed. This would give consumers an empowered, hassle-free, yet real-life unique shopping-experience. The photo-booths installed in the store would not only function as a photo booth, but as a real-life Instagram-booth. On the screen they would be able to see themselves through various Instagram filters, take photos with the applied filters and share them on their preferred social networks. If choosing to purchase an item, their photos would also be displayed on the billboard mounted outside the store. Shoppers would gather outside the store, take pictures of themselves on the billboard, share the photos on their social networks again and as a result- tempt other attention-seeking friends to visit the store and purchase items. Sales-personnel would challenge shoppers to participate in the “like” contest: if participants managed to attract more than 100 likes on their Instagram-booth photos, they would automatically purchase the outfit with a 10% discount. This would work as an incentive to share the photos and use various other hash tags in order to increase the amount of likes (using many hash tags would be beneficial for Top Shop so that people searching for other popular hash tags would discover the Top Shop photos as well). For this contest they would use the ITTT.com (if this then that) application to automate the process. This would optimize the sales prospects for Top Shop. It would also be a way of transforming a digital concept into a real-life fun activity and take it back into an exciting, unique shopping experience. Following the Fashion Show the Top Girl + profiles would have a one-week limited option to “design your own accessories” to match the new collection. As part of a special Fashion Week feature and as an effort to drive shoppers to the store, Top Shop would install a 3D printing machine in their flagship store. Within the TG+ (Top Girl +) profiles, users would be presented with the opportunity to design their own accessories to match the new collection. They would choose from a wide variety of template products (including rings, necklaces, earrings) and customize the stones, colors and metal before finalizing the design. 3D printing is quickly gaining popularity and is particularly raising many concerns and opportunities for the future of the retail industry. By introducing this limited-time feature during the Fashion Week hype Top Shop would strengthen their label as a forward thinking, bold and innovative brand. Using Google Hangouts as part of the TG+ profile, friends could collaborate to design birthday presents, friendship bracelets, anniversary gifts and the like. They could share their designs on other social networks and receive feedback within their profiles through API’s displayed on TG+. When satisfied with their designs, they would schedule a time for printing, and pick up the product in the store. The installment of the 3D printer would effectively be an effort to interest curious in-store shoppers to create TG+ profiles in order to design their own jewelry, in addition to attracting online shoppers to the store itself (with the overall goal of increasing in-store sales as they wait for their designs to print; and considering the newness of this technology it is likely that they would want to observe the process in real life). It would also be part of their strategy to turn a personalized, fun, digital experience into a tangible product through an innovative method currently unfamiliar too many.